The mbox importer software posses add file option and enables user to add more than one mbox file at once. This feature of the tool help you to perform bulk import mbox file to Mozilla Thunderbird easily. By processing multiple files simultaneously software saves valuable time and import mbox file quickly. The Thunderbird Import Wizard Software provides option to add mbox file or folder. According to requirement user can select either Select File or Select Folder Option. Select Files: - In this option you can select single mbox file at once. 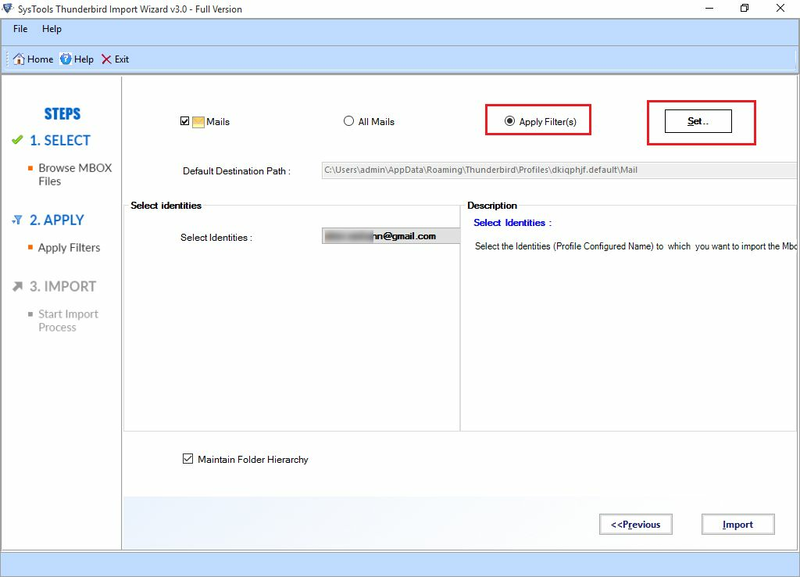 Select Folders: - In this feature software permit you add multiple mbox files into Thunderbird email application. 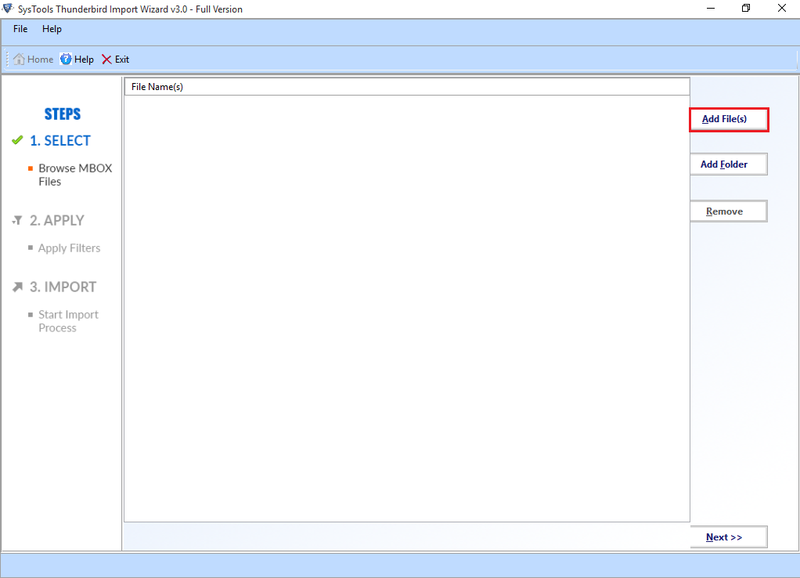 The mbox importer tool is the best software to import mbox into Thunderbird. After importing mbox file user can easily read, open, edit mbox files. Software enable you to import mbox file along with its entire attribute like emails, attachments, notes, journals, media etc. It is the safe and secure utility. 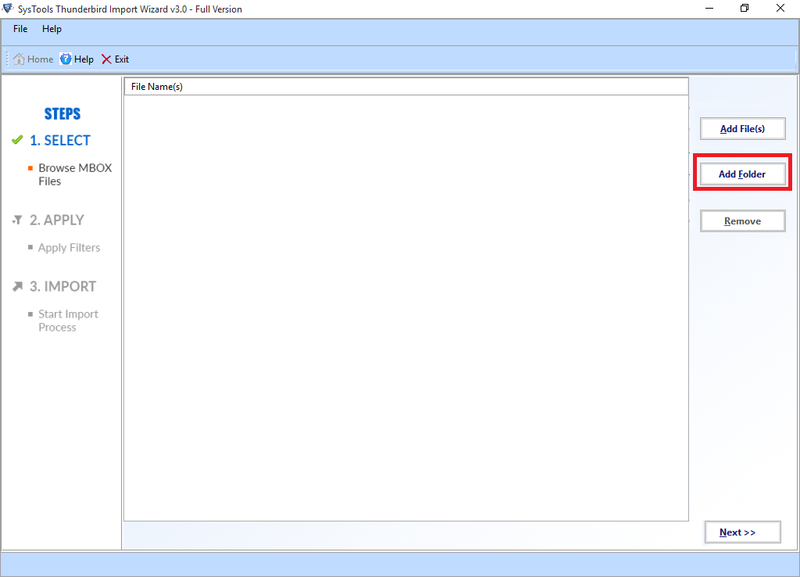 The Thunderbird Import Wizard Software is designed in such a way that, it does not affect data integrity while importing mbox file emails to Mozilla Thunderbird. 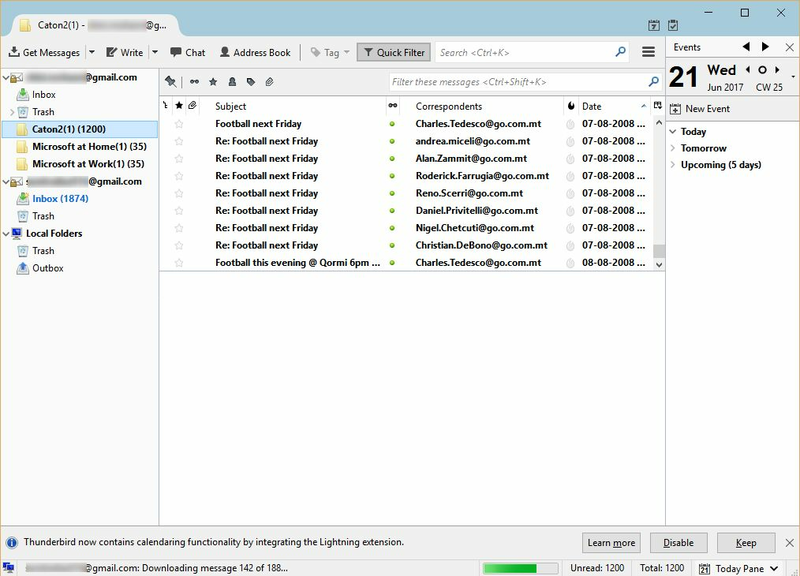 The email property like email header, email body, email attachments and other attributes remains unchanged in the destination Thunderbird profile. While importing mbox file into Mozilla Thunderbird the software maintains mbox file folder structure same. The software support to import nested mbox file to Thunderbird so it is very needed feature to maintain folder order same at the destination folder. So that user can easily explore mbox file after importing to Thunderbird. 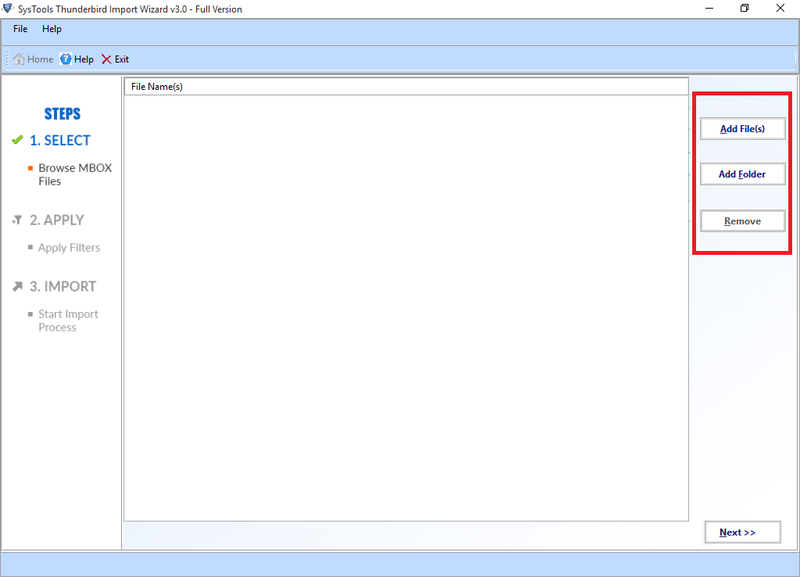 The Thunderbird Import Wizard Software provides an advance feature that restrict you to import mbox file only into default Thunderbird email profile. 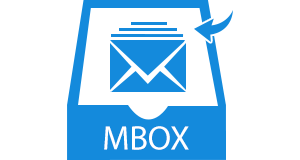 By using this tool you can import mbox file to any email profile which is configured in the Thunderbird. This feature of the software make it different from others. As the mbox file may large in size and user need to import only some selected emails from it. 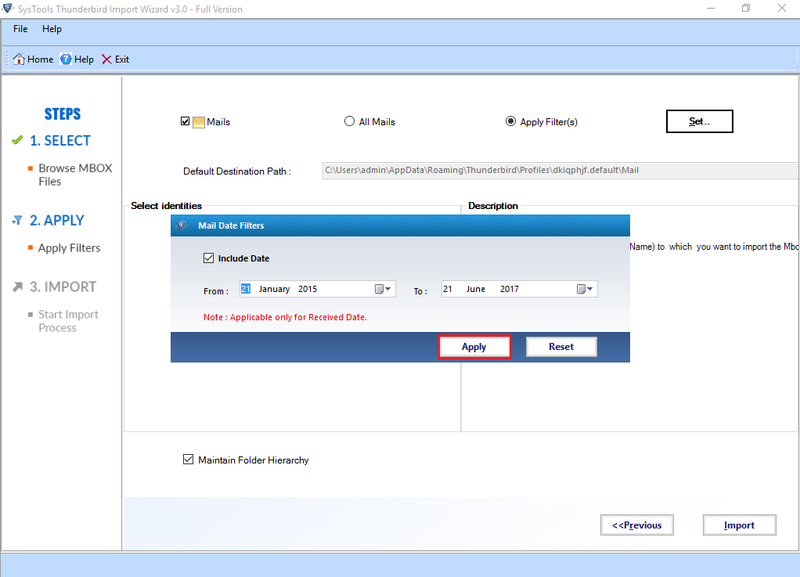 Then user can apply date filter and import only required emails from mbox file. In this user need to specify date range and then mbox importer software will include only those emails which lies within the specified date. The software is designed in such a way that, it can import any size mbox file to Thunderbird email account easily. The mbox file importer software does not impose any file size limit, while performing mbox import process. It ensures for complete data transfer without loosing single bit of your important data. I saved my .mbox file in pen drive. Will this software import that in Thunderbird? Yes, the mbox importer software can import mbox file to Thunderbird from pen drive or any drive. Is this utility compatible with Mac OS? No, the Thunderbird Import Wizard utility is compatible with only windows os. It support all version of windows operating system of 64 & 32 bit, like windows 10, 8, 7, vista and all below. Will the software transfer .mbox file to Thunderbird created by Apple Mail? Yes, The thunderbird import mbox file utility can import .mbox file which is created by apple mail mbox, gmail mbox or any other email client mbox file. Is the software posses any size limit to transfer mbox file to Mozilla Thunderbird? No, The tool is designed in such a way that it can move any size mbox file to Thunderbird email client. 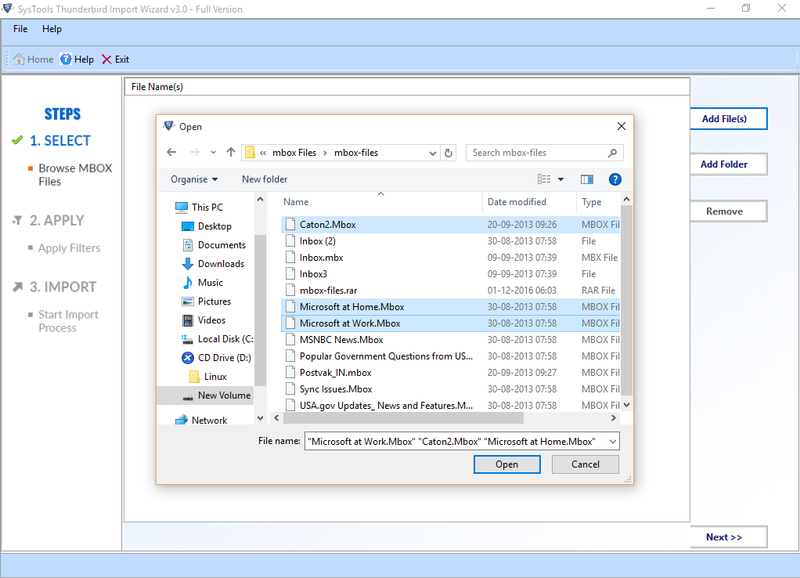 Can I import selected items from .mbox file by using this software? 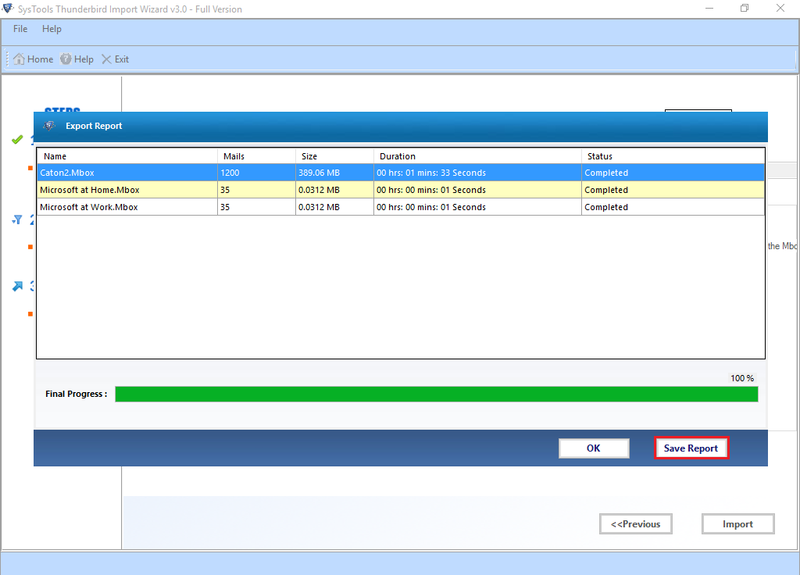 Yes, The tool provides date filter option to perform selected mbox file migration. You need to simply provide data range and software will import only those emails which lies in the provided date range. First download the software and then install on your system. Now the home window of software will appear like this. 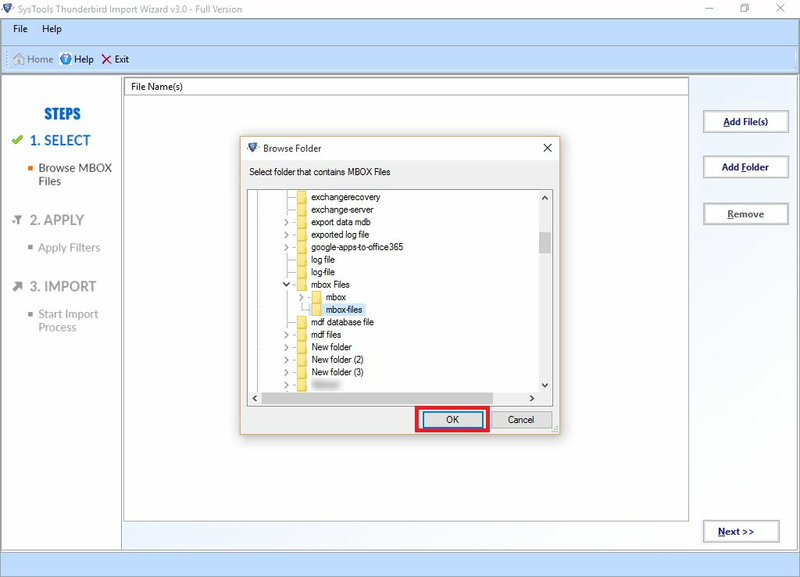 If you want to import imox file then click on Add Files button. Select MBOX files and click on Open. If you want to import .mbox folder then click on Add Folder button. Select MBOX Folder and click on OK. Note: - You can perform only one option at once either select Add File or Add Folder Option. Here software will enable you to apply date filter, simply click on Apply Filter(s) radio button. Check on Include Date option and provide Date Range. Remember on thing that this feature is applicable only for receive data. Hit on the Apply button. Now the Thunderbird Import Wizard Software will show all configured email profiles. 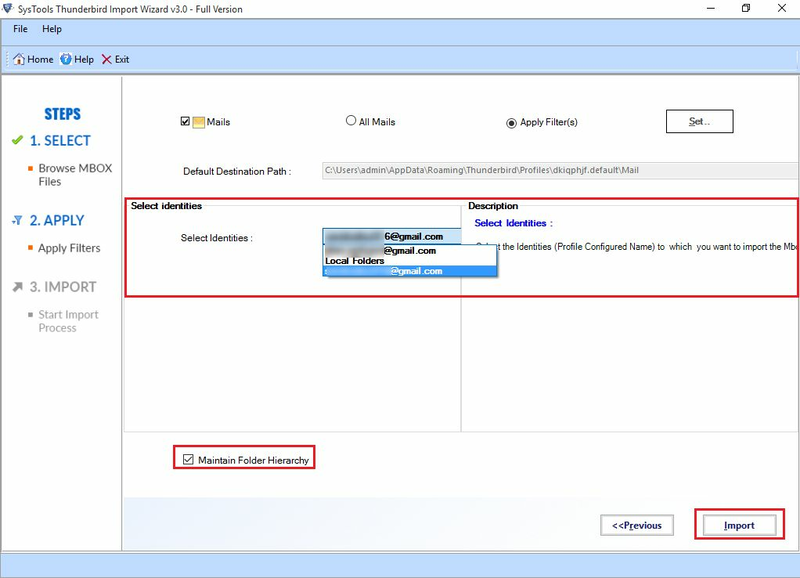 Select the desired one and check Maintain Folder Hierarchy check box. At the end click on Import button. Here software will show a successful message on completion on import process, simply hit on OK.
View the import process details like Number of mails, Size, Duration and Status. 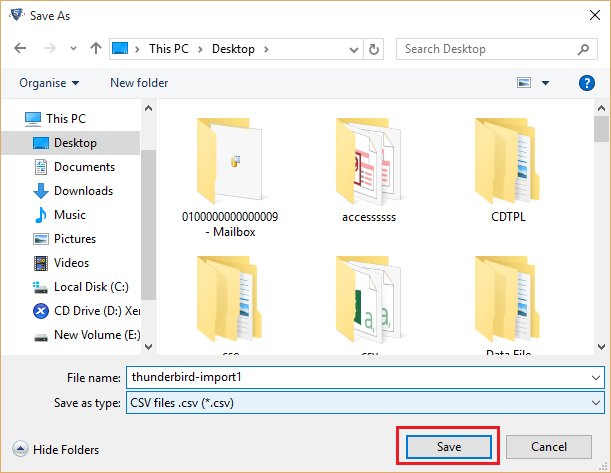 Provide the location to save Thunderbird import detail and click on Save. Now click on OK button from the Export Report window. Now software will ask you to perform import process again or not. If you want to import other .mbox file click on Yes otherwise No. Open the Thunderbird an and view entire imported data easily. "I never thought that importing mbox file is so easy as the Thunderbird Import Wizard Software made it. The software is quite easy to use because being non technical I Imported entire mbox file into Thunderbird profile. I would like to thank software development team for their effort, Thanks a lot!." "Thanks for developing such a grate utility named as SoftwarePro MBOX Importer Software. It facilitated me transfer complete mbox file to Mozilla Thunderbird. The availability of free demo version of software help me to analyse working of tool without any investment. I want pay great thank to the support team for their step by step help!."